3 bedrooms, 2 bathrooms with grab bars, living/dining room, kitchen, two balconies, one with partial ocean view, other with great tree canopy view. Updated with master sink/vanity. MW, DW, 4 Satellite TVs, DVD, WiFi. ONSITE POOL. NO PETS, NO SMOKING. ONE (1) SET OF BED LINENS & TOWELS PROVIDED. BEDS: 1 King, 1 Queen, 2 Singles, sofa bed. Accommodates 6. 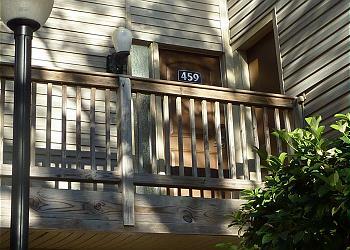 Terrific condo, great staff on site and at Jekyll Realty! Make sure to get off the Island and try the great food at St Simons as well as Driftwood Bistro! The villa was perfect for our family. We enjoyed our visit. This was our first time renting through Jekyll Island Property Sales & Mgt, Inc. and all the personnel we dealt with were friendly and professional. The condo was very nice. I have a hard time sleeping away from home and was concerned about the beds. The one I slept in was awesome! The kitchen had pretty much everything we needed. It is a quiet location and we enjoyed it very much!